This version of Windows Movie Maker is not compatible with your operating system, veja a versão compatível. Olá pessoal, já uso esse aplicativo há anos mas, gostaria de perguntar aos amigos usuários como posso utilizar o arquivo de configuração que ele cria. Só assim não haveria a necessidade de configurá-lo sempre que for preciso reinstalá-lo, desde já agradeço quem me ajudar. Estou tentando entrar em contato com a empresa nos telefones,skype,e-mail,whatsapp informados no site mas ninguém atende ou responde. Apesar de aparentemente simples e eficiente, difícil comprar um produto onde a equipe de suporte não existe. Windows Live Movie Maker has extensive support for high definition video and compatibility with the most popular devices on the market. This means that you edit high quality videos from different devices, including the latest generation mobile phone and camera. 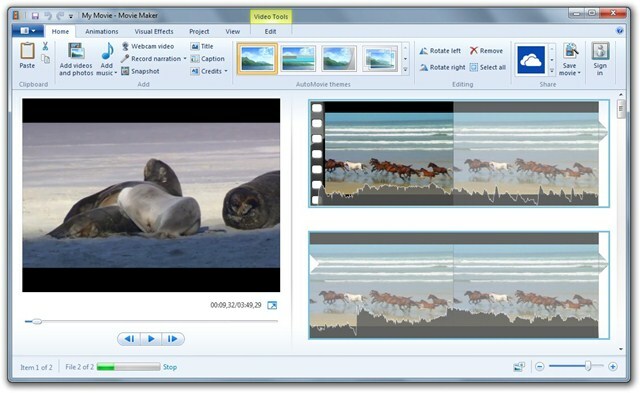 This version of Movie Maker achieves maximum compatibility with Windows, taking advantage of the best that Microsoft's latest operating system offers. It is recommended for creating short films and photo presentations in an easy way. This facility reaches the maximum level with Auto Movie , which simply creates a movie with your photos and videos in less than a minute. Try the new Windows Movie Maker 10. Your name is no longer "Live"
In the 2012 version, Windows Movie Maker gained the sound wave view, freeing up the possibility of arranging the audio to keep it synchronized with the images. In addition, another added option is responsible for emphasizing the background music or just keeping the audio of the video, something good for those who usually narrate with a background music the images presented. Video Stabilization is a unique Windows Movie Maker function, making use of OS hardware management to improve the quality of recorded videos recorded via mobile. He has also partnered with the AudioMicro, Free Music Archive and Vimeo Music Store services, allowing you to add music to your videos without worrying about copyright. If you had trouble adding captions to your videos, Movie Maker has gained new editing options for text, making it possible to add highlights and other details so that the lyrics do not get confused with the background images. Also, since the H.264 format is very popular and is virtually mandatory when uploading videos to many websites, it has become the standard Windows Movie Maker. Adding photos, videos and soundtrack to a Windows Movie Maker project is something that can be done in a moment. You can either drag and drop the files or click the "Add videos and photos" button. Just select the desired content. Ease is the big goal of Windows Movie Maker. A movie can be made in seconds, simply add photos and videos, choose the track and activate Auto Movie . The editor will assemble everything with effects and transitions, creating a basic movie quickly. Reading it sounds easy, and it really is. There is no secret, just select the content and click the "Auto Movie" button. Of course, you can continue editing by modifying any aspect you want. The key point of this feature is that "dirty work" is done for you in a moment. You can either accept the result or continue editing to improve it. Completely escaping from the standard of video editors, the Windows Movie Maker timeline does not exceed the screen boundaries horizontally, creating different lines from top to bottom. It has more than 60 transitions, 18 zoom options and 20 visual effects that can be applied, plus features like cropping, separation and fade. They are effects like cross-fade, dissolution, pixelizar and others to perfect the assemblies. With the project open, simply go to the "Animation" tab to display the transition options. All of them can be previewed, modified and removed. They are hearts, stars, diagonals and other types. The "Visual Effects" tab displays effects possibilities. They are variations of pitch, filter changes, turns, etc. Effects and transitions are applied to each frame individually, making editing and removal easy. This amount of effects lifts Windows Live Movie Maker to a richer level of editing, the kind that is more than just putting videos and photos together. Once ready, a video can easily be uploaded to YouTube through a program menu. In the "Sharing" area, the YouTube button is easily identified. Just log in to your account and follow the instructions, informing title, description, tags, category and permissions for your video. Click "Publish" and your video will be on YouTube quickly. You can also send it to Facebook via a plug-in. Other shipping options will be added in the future. Burning a movie on DVD or saving it in high definition is also easy, as well as reducing the quality to save it on a mobile phone, for example. All possibilities are represented in the "Sharing" area. It is undeniable that Microsoft's video editor has improved greatly from the Beta to the final version, but the truth is that it continues to be the branch break for those who do not have or do not know how to work with another publisher and who wants to edit a video in few minutes. There is no doubt that he is one of the easiest editors to use, but he is also an unsophisticated publisher, for those who do not have big pretensions and do not want to waste time. Familiarity with the Office tab system makes it even easier to use Movie Maker. Windows Movie Maker is better, no question. It is a nice and attractive program for novice or extremely impatient users. It is a fast and light program. For advanced users, Movie Maker is far from pleasing, it's even derisory. The interface is a plus point for the program. What you can do is easily identified without many clicks and explained in brief descriptions. The Auto Movie feature is great for anyone who does not want to spend a minute setting up a video, ie casual users for example. At the same time, it's an interesting way to start an edit, since you can continue editing even after applying Auto Movie . Working with soundtracks requires a little attention. The Auto Movie feature does not apply fades automatically, so you need to adjust the track. For audio work, the tools are simple without many options.